The Villa is built of stone and is totally immersed in a forest of trees a few kilometers from the center of Gambassi. The villa was built around 1900 as a hunting lodge, later was transformed into a large private library where the owners took refuge for reading in complete privacy. The Holiday villa with private swimming pool is built on 3 levels, has 9 bedrooms and 7 bathrooms, can accommodate from 18 to a maximum of 24 people using 3 bedroom annexe to the side of the villa. Outside the villa there is a veranda with garden furniture, barbecue, solarium, private heated pool with Jacuzzi for the exclusive use of the villa. The villa is well furnished, the furnishings are mostly original, and provided with the best services such as heating, central air conditioning, mosquito nets, TV + SAT, Wi-Fi, large electric oven and fridge, dishwasher, washing machine and dryer, these along with spacious rooms and various spaces and comfortable even in the living area make this villa an ideal and pleasant to meet with family or friends. addition to piscna private gl guests have access to a large swimming pool on the estate. 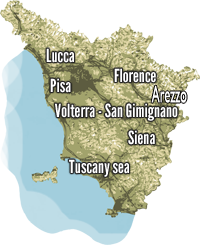 The strategic position where you will find the villa is perfect for visiting Florence, Siena, San Gimignano and Volterra, in the immediate vicinity are golf courses and horse riding. • large private outdoor parking. • 1 suite with 2 double bedrooms and large windows with a beautiful view of the garden, 1 bathroom / shower. • 1 suite with 2 double rooms, with windows overlooking the garden, 1 bathroom / shower. The total price includes: VAT, electricity, gas, water, bed linen and towels, use of the pool from 01/05 to 15/10, weekly change of bed linen and towels, final cleaning, wi-fi. Size pool 3 × 6 m, H.max. 1.60, + whirlpool.